There’s something about being in the right place at the right time. Somewhere you may have visited before maybe, that’s different second time around. Or somewhere that you didn’t expect much from, but gives you exactly what you need at that point in time. I don’t remember really why we decided to come to Itacare instead of somewhere like Morro de Sao Paolo or one of the many other small beach towns in Bahia. I love the sea but I can’t surf, and I don’t like sunbathing (although I love being outside in the sun, so yes I’m full of contradictions!) I think it was the mixture of activities available nearby and the chance to see some more beautiful Atlantic rainforest scenery. Itacare is one of those places that’s so relaxed you don’t want to leave. Maybe after a while the slow pace of life would get to me, but for a few days it’s the perfect place to slow down. Something I don’t do often enough. Beautiful, semi-deserted coves where tiny streams and small waterfalls cascade directly onto the beach. Surrounded by rainforest, a lone snack stall sells fresh acaraje and tapioca pancakes. One by one surfers arrive to ride some of the best waves in Brazil. 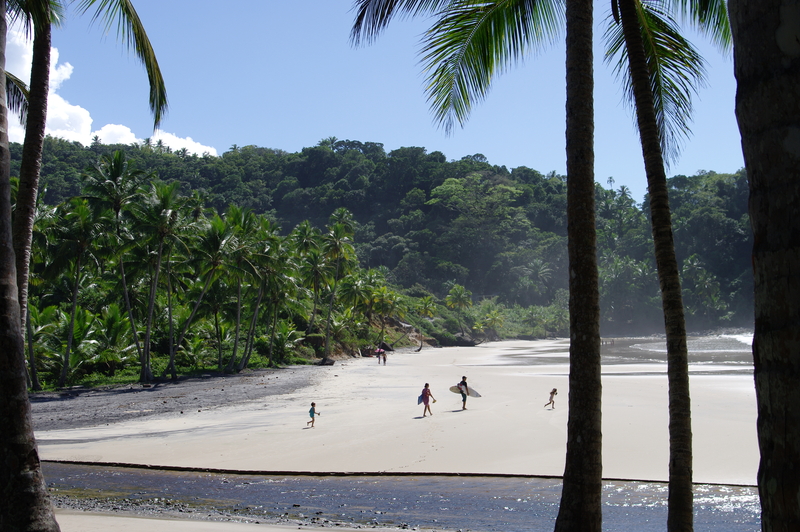 Itacare and the surrounding coastal areas are the Bahia I’d been looking for. The dirt tracks behind the Praia da Concha are filled with pousadas, but at this time of year nothing feels too hemmed in or over-developed. There are plenty of restaurants and low-key bars along the main streets. Walking through cool rainforest, the remains of a half-built development appear. A Portuguese visitor fell in love with Bahia, bought some land and started to build. Without permission, as it turns out. A strange collection of empty brick and timber lodges lie scattered, walls missing as the forest slowly claim them back. One of my favourite days of the trip. Heading upriver from Itacare in a dug-out canoe. Hundreds of crabs line the mangrove banks. The school boat passes by on the way to class. After an hour we leave the main river and turn inland up a small creek, shady and cool. We reach a waterfall and climb up past two natural pools to a third, ok for swimming.